It was a great joint venture between our company and Collective-E last week... Beth Schoenfeldt and I each moderated a panel and the 50+ attendees were really on their game. The questions were plentiful. Make yourself unique -- we don't need more beautiful jewelry we need more jewelry that has a unique point of view. Sarah Graham has made her name on her blackened metal alloy mixed with yellow and white golds. Be persistent but not a stalker for press and retailers. Pitch appropriately -- don't send funky jewels to bridal mags, nor mega-diamond jewels to Redbook. Don't pitch Lucky if you don't have any national distribution. Court retailers for a while -- they have to cycle people out to let you in so it can take a season or three. Be patient but persistent. And very very friendly about it. Empathy is the key. Sales reps are very hard to find in the fine jewelry business so before you're established (and some come to you or you meet them at trade shows once you're doing them!) hire an enthusiastic advocate for your designs. After the seminar we had a tour of the show floor and many of the attendees were so thrilled to meet the exhibiting designers. Here, Erica Molinari, gives great advice to these young entrepreneurs. 30TH Anniversary of JA New Designer Gallery - what a party! This was the 30th anniversary of the JA Show's New Designer Gallery and we threw ourselves quite a fete! 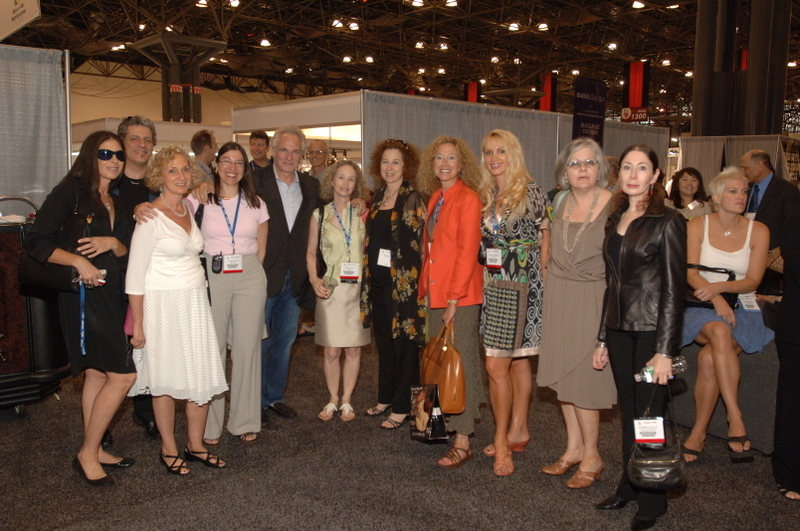 First came the ceremony - nearly 50 of the 300+ alumni came to celebrate and remember old times with each other... seen in the photo is Janis Savitt (M+J Savitt) Steven Lagos, Beth Moskowitz, David Yurman, Sheila Kahn, Frederica, Karen Gerstl, Deborah Blohm, Kristin Moore and Esther Gallant. Each having been in the New Designer Gallery when they debuted in the industry. It was a GREAT time. Next came a reunion dinner I organized for all -- we had more than 120 people there -- all laughing and telling stories and genuinely having a ball. This was one of those epic events that made you glad to be part of this crazy business. Next time we have an event - - I hope you all can be there!